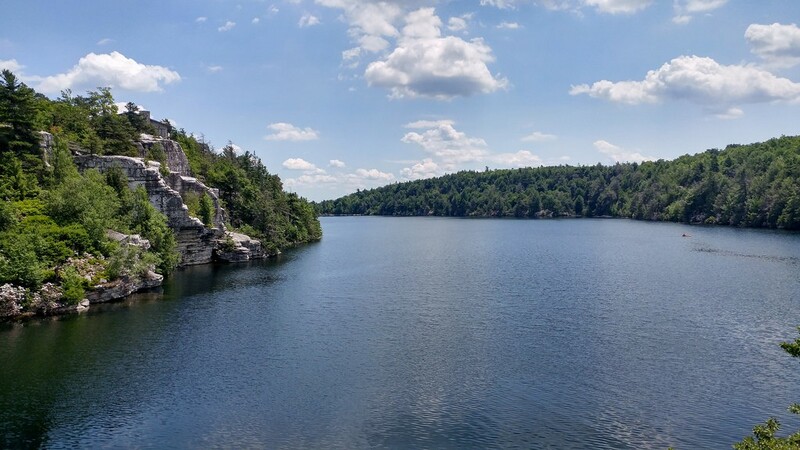 Minnewaska State Park offers miles of carriage roads as well as more intense hikes, plus a beach area when you are ready to take a break and cool off in the lake. In the thick summer heat—especially a summer like this one—the idea of hiking can be daunting. You’re probably already sweating sitting still! Enter the hike & swim combo. You work up (even more of) a sweat, but then you get to dip into a cool pool, a sandy lakeside beach, or the gently eddying waters of a mountain creek. You get the satisfaction of exercising, but you get to enjoy it too. Grab your bathing suit and your hiking boots—and maybe a wide-brimmed hat and some coral-safe sunscreen—and it’s game time. Imagine an enclosed net of sorts floating in place in the Hudson River—offering the expansiveness of the open water without the danger. Voila! You have the Beacon River Pool. A fixed mesh floor maintains a depth of 24-30 inches, making this more of a wading pool for adults, but a kid-safe hit with families with little ones. For adults, the circular edge of the pool serves as a place to sit and dangle your legs into the cool river water. The pool was the brainchild of famed folk musician/activist Pete Seeger, who envisioned that by enjoying the Hudson, people would come to feel a greater sense of responsibility as the river’s caretakers. The current wading pool is a prototype of a larger pool planned in the future. After dipping your toes into the Hudson, you can hike up to where you can look out on Beacon and the broad waters of the river that Mr. Seeger sought to protect. 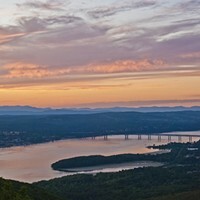 Scenic Hudson's Mount Beacon Park offers a convenient approach. 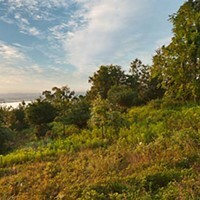 From downtown Beacon, just walk to the junction of Howland and Wolcott Avenues, enter the park, ascend the stairs, and you will find yourself standing in a kind of natural gallery, with the panorama of the City and the Hudson River spread before you. Those looking for a longer hike can continue their ascent to the summit of Mount Beacon on more rugged trails. Or do it in reverse, for a post-hike cool off. Bear Mountain State Park is the second-most popular hiking destination in the region after Breakneck Ridge. 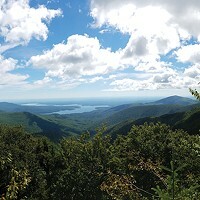 At Bear Mountain, however, hiking is spread across many different trails, while at Breakneck, hikers are concentrated on a single short segment of rock scramble. The ascent of Bear Mountain itself is a satisfying classic, with a fire tower at the summit. Other options include Dunderburg Mountain and the meandering trail to the impressively-named Popolopen Torne, with its sweeping views of the Bear Mountain Bridge, the Hudson, and the steep rise of Anthony's Nose across the river. Swimming in the lakes at Bear Mountain is not permitted, but there is an outdoor pool here, just east of Hessian Lake. Black Rock Forest is a jointly-owned park with a mission of environmental research and education. But there are many miles of trails here, too, and the park is open to the public for hiking. Black Rock Forest and the Storm King Mountain area of the Hudson Highlands State Park are adjacent, making it possible to hike through both areas in a single day. Most of the lakes in Black Rock Forest are actually reservoirs in which swimming is prohibited. But if you're interested in wilderness swimming—at-your-own-risk and without the protection of lifeguards—swimming is permitted at Sutherland Pond. A three-mile hike is required to access the pond, but it offers a refreshing reward after a sweat-soaked hike. Who says sandy beaches are just for ocean-goers? You can plunk yourself down this summer at Fahnestock’s Canopus Beach. Fahnestock is accessible by car via the Taconic Parkway and NY 301 (but not by public transit). During the 1930s, the Civilian Conservation Corps dammed the Canopus Creek, creating the present-day Canopus Lake. Until Labor Day (9/3), the beach is open daily from 9am to 7pm, and for swimming from 10am to 6pm. A spur trail from Canopus Beach to the Appalachian Trail is popular with swimmers. Park Manager Evan Thompson says, “People who come to the beach can make a short loop and see a wonderful vista from the AT above Canopus Lake.” Check out Fahnestock’s official site to get more info including swimming hours. For those seeking the finest rugged beauty that the region has to offer, look no further than Lost City & Split Rock, both accessible from the Coxing Trailhead within the Mohonk Preserve—a private, member-supported park that adjoins the Mohonk Mountain House resort property. The Lost City area offers a series of crevices and boulders similar to the well-known Lemon Squeeze of the Mohonk Mountain House. Like the Lemon Squeeze, if you choose to hike the Lost City area, be ready to use your hands as well as your feet (a method known as rock scrambling). And please be confident of your fitness before attempting to hike through the Lost City area. Split Rock is a natural swimming hole also near the Coxing Trailhead. Over time, the Coxing Kill Stream carved a notch into the rock, creating a small waterfall within the notch. The two sides of the notch now face each other like squat cliffs—thus, "Split Rock." You can find loads of impressive photos online. Unlike some natural swimming holes, Mohonk Preserve actually does permit dipping into the water here. Park staff describes it as a wading pool, however, and actual swimming may be limited by the depth. Finally, please remember that as a natural swimming hole, there are no lifeguards here, so swimming is at your own risk. It's hard to go wrong when choosing a hiking route in Minnewaska. What makes this New York State Park Preserve special is not the traditional (and very worthwhile) process of slogging up graded trails to attain a summit. Instead, at Minnewaska you can traverse ridges with commanding vistas along the entire ridge. Carriage roads were built for visitors to the hotels that once stood on the site. Nowadays, thanks to these unusually wide trails, you can walk shoulder-to-shoulder with your hiking buddies, while rougher and narrower wilderness trails offer a more traditional hiking experience. Like other parts of the 'Gunks (the Shawangunk Ridge), Minnewaska is distinguished by formations of white, quartz-conglomerate rock and short, scrubby pines. In the winter, you will stumble upon frozen waterfalls and giant icicles. The large frozen lakes might make you stare and wonder why you bother doing anything other than hiking here. In the summer, you can swim in the sumptuous clear water of Lake Minnewaska and the much-larger Lake Awosting, with their rocky shores. During swim season, lifeguards are posted at designated swim areas at both lakes. Swimmers cared enough about enjoying Lake Minnewaska that they lobbied (successfully) for the right to swim longer distances here. If you're interested in this kind of swimming, look up the Minnewaska Distance Swimmers Association (MDSA). Once you see Minnewaska for yourself, you'll know why they worked for the right. Get the Lake Minnewaska and Lake Awosting swim hours. Swimming is permitted in two areas in Taconic State Park, with designated swimming areas and lifeguards at both locations: Copake Falls and Rudd Pond. Both of these areas also have campgrounds near the swim areas, so keep in mind that this may feel less like the wilderness compared to Minnewaska, for instance. There are also hiking trails here, and the popular attraction Bash Bish falls is nearby in Massachusetts. Check Rudd Pond swim hours or Copake Falls swim hours. before you plan your trip. Linda Cooper, Regional Director of the Taconic Region of New York State Parks, recommends calling to double-check that swimming is open toward the end of the season at Fahnestock and Taconic Park. Many lifeguards are college students who go back to school at the end of the summer, which can create a late-summer guard shortage. New York State Parks hires people of all ages and backgrounds. To apply to work as a lifeguard at one of the parks in the Taconic region, please contact: Evan.Thompson@parks.ny.gov.